mdtny2012 has no other items for sale. Got what I ordered fast and easy. Thank you for the great service. Item Never received! Waste of money! I love it. It's absolutely gorgeous. Reasonable condition as far as I can tell. Very pretty and sturdy! Thank you! Love it!! Exactly as described Fast shipping Ty!!! Main gem missing from top of tiara. Great if its to use with a veil, I purchased for my friend and she will not be using one, so we will make some modifications on hairstyle so it won't fall off. Other than that looks great. Ordered for my daughter for a Halloween costume. It was a little big for her head (she's 7), but I was able to gently bend it for a little more curve and it fits well. She loves it, I feel like I got a good deal on - so win/win. It is sparkly and feels hefty (no flimsy metal here). My grand daughter wanted to he a rodeo princess this will fit about her hat just fine. Very nice crown perfect for the cowgirl.hat. 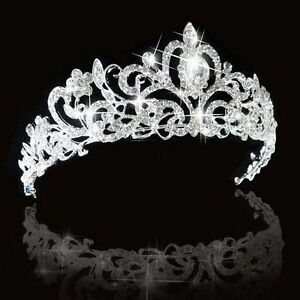 This crown is perfect for any Adult, it’s sparkling and very well designed. I am going to attach 2 small clear combs on the ends for it to be stable. No regrets! I purchased it for a wedding. Great value and looks great.